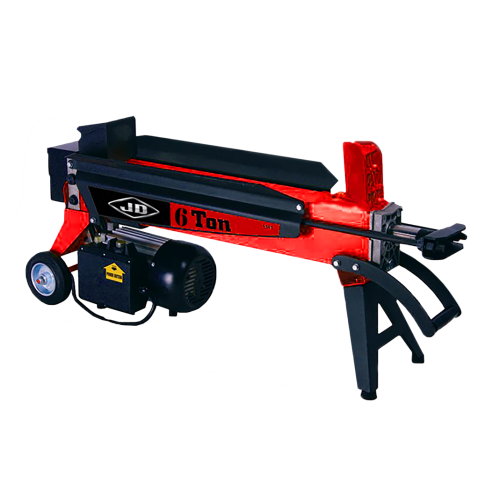 Getting winter firewood ready is quick and easy with this 6 Ton Electric Log Splitter. The 120V electric engine delivers 1500w of power to cut logs up to 20 inches long and 10 inches in diameter. This unit is powered by a long wearing hydraulic press, splitting wood with up to 16MPA of pressure for efficient splitting. With stable rubber feet, easy to use carrying handle, and sturdy wheels this is easy to get around. A great choice for most home owners’ wood splitting needs. Electric log splitters are a great, eco-friendly choice in splitting wood, both indoors and out. This model can be used safely in a garage or building, during those bitterly cold days. These consumer grade electric wood splitters are designed for those that are planning on splitting logs for a personal stockpile or for uses in a fire pit when camping, fireplace or wood burning stove. Getting winter firewood ready is quick and easy with this 6 Ton Electric Log Splitter. The 120V electric engine delivers 1500w of power to cut logs up to 20 inches long and 10 inches in diameter. This unit is powered by a long wearing hydraulic press, splitting wood with up to 16MPA of pressure for efficient splitting. With stable rubber feet, easy to use carrying handle, and sturdy wheels this is easy to get around. A great choice for most home owners wood splitting needs. JD North America is a global manufacturer and distributor of outdoor power equipment. Founded in 2005, JD North America began marketing products in the North American markets to large retailers as well as independent dealers.